This shouldn't be possible in a Mazda Miata. The Goodwood Festival of Speed is unlike any other auto show. Yes, there are new car reveals and plenty of static displays for you to drool over, but you also get to see a salivating selection of cars in action as they tackle the famous hill climb. Only at Goodwood will you see historic racing machines and contemporary supercars tear up the same stretch of asphalt. This year also saw the festival’s first ever drifting competition where some of the world’s most skillful sideways drivers competed for the title of Goodwood Festival of Speed Drift Champion. Seasoned drifter Mike Whiddett, better known as Mad Mike who is a regular at the Goodwood Festival of Speed, stole the show in his modified Mazda Miata, in a dazzling drifting display that engraved the tarmac with copious amounts of tire marks. Mad Mike is best known for performing tire-shredding slides in tuned Mazda RX7s. For this year’s Goodwood Festival of Speed he brought his Miata affectionately known as “RADBUL Gen2.” Though it wears the bodywork of a fourth-generation MX-5, it’s actually a third-gen model. The drift machine ditches the 1.8-liter naturally aspirated four-cylinder engine of the standard car and replaces it with a twin turbo, quad rotor replica of Mazda's 26B race engine famously used in the Le Mans-winning 787B endurance racer. 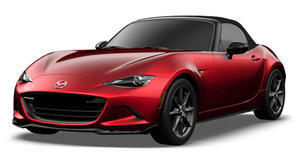 The result is a Mazda Miata that produces a mind-bending 1,200 horsepower. Whiddett wasn't the only star to showcase his sideways drifting skills at Goodwood this year. Joining him was Vaughn Gittin Jr in his 900-hp, tire-shredding Mustang RTR. Also competing in the inaugural Goodwood Festival of Speed drifting competition was current Formula Drift championship leader James Deane in a Nissan Silvia, and 2009 Prodrift European Series winner Dean Kearny in a Dodge Viper. You can watch Mad Mike show us how it’s done in the video above. At least he didn't hit any hay bales, unlike some of the other victims the hill climb claimed this year. It really shouldn’t be legal to have that much fun.